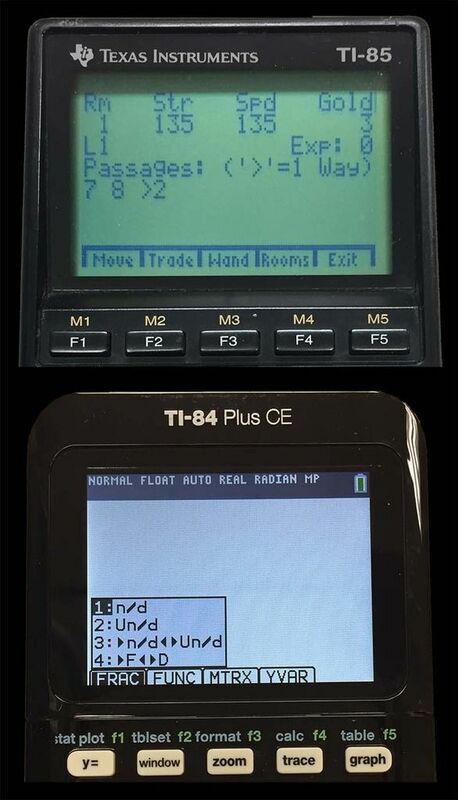 The Menu function in the TI-84 Plus CE is completely different, but the tabs are still there (FRAC, FUNC, etc.). I know the GetKey function will let me capture when someone presses a function key, but is there a way to program those tabs on a TI-84 Plus CE? "Quini, quidi, quici" - I came, I saw, I played a little quidditch. The TI-84+CE OS does not support such a function, at least not on the homescreen. On the TI-83/4+, you could draw those tabs on the graph screen, but because the graph screen is shrunk on the TI-84+CE, that doesn't work anymore. Enter in that program like a BASIC program, and then run it like Asm(prgmWHATEVER . This will enable lowercase. You can disable lowercase by changing the second line from FDCB24DE to FDCB249E (only the second-to-last character changes). Well, as you stated, there is the getKey command which will allow you to poll the keyboard for a keypress. If you want to do it like on the ti-85 and ti-86, you will want the menus at the bottom of the homescreen. You could make something similar (like a slow and messy clone) by simply displaying the options and then using the getKey command to figure out what key was pressed. If you want a good example of this in action, you can take a look at ohernandez's Pertiodic table program. It is written in Hybrid-basic so if you aren't familiar with that, the code might look a bit strange, but IIRC, the part where he does the little menu thing is essentially pure basic. It is completely aesthetic though so it is up to you to decide if the slower speed, larger amount of work and bigger code is worth the change from the Menu() command. This makes me wonder, are you doing this to port an old program to a newer calc and want it to look as similar as possible to the original? tl;dr, it is not possible to easily make menus appear on the bottom like on older models, but you can make a patchy solution with a bit of elbow grease. Of course, this code could be modified slightly to do things like draw this menu on the graphscreen instead of the homescreen, or maybe add some lines around the options to make little boxes. Members: commandblockguy, nottoday, slimeenergy, _iPhoenix_. © Copyright 2000-2019 Cemetech & Christopher Mitchell :: Page Execution Time: 0.301592 seconds.